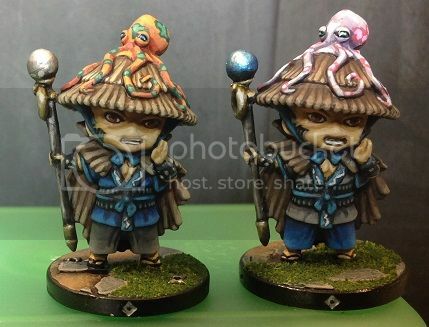 Just finished painting my Ika Chunin. I will be doing some freehand on his cloak later, but for now I want to get the clan painted and on the table. Should have 2 x Madoushi photographed tomorrow. very cool! 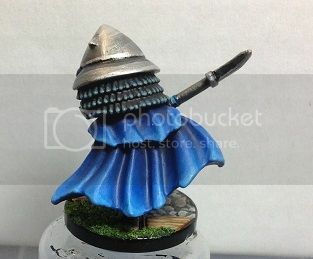 The blue gradient for the cloak came out very nice, and I like the base. 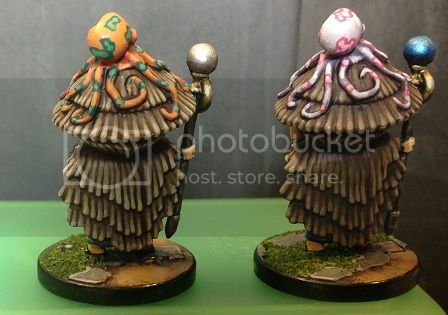 I love the octopi on the hats. But I think I would have tried to change the colors of the hair too- you did switch the colors of the trousers and jacket, what I wasn't able to see at the first glance. I´m looking forward to the next miniatures. I have to get better with my photography. One guy has Blue Black hair and the other Dark grey. Their trousers and Robes have been swapped to help differentiate them. I will be working though my Ika fully and then Painting my Brothers Kitsune Chunin before I head off into some more SDE. I have to post up all of the SDE that I have painted since my last posts there too. Looks great! Especially good work on the bases. 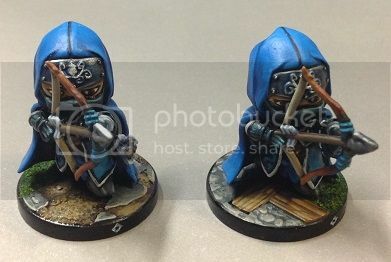 Very good painting and really like the bases, looking forward to seeing some more. Beautiful work... I absolutely love those octopi! 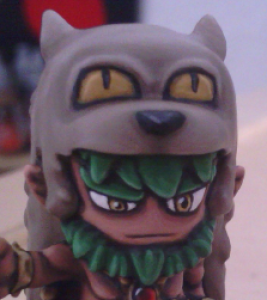 Can I ask... what brand of paint did you use on the Chunin's helmet? That's a really nice shine.. is it metallic paint or a gloss finish? Either way... it looks great! I use a foundation paint to base my metals, on this guy it was Adeptus Grey. 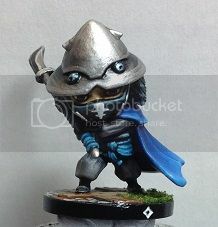 Then it's Army Painter Gun metal, Army Painted Plate Mail metal. Then I wash it (Blue/Brown/Black mix). Then I shadow it with a Blue/Black/lahamian medium paint wash. Pick out Plate mail Metal and then Mithril Silver, Then Vallejos Metallic Medium. I think I lined it with a Blue/Black Ink too. No Gloss I use Dullcoate on my minis. I thought i recognised Mithril silver... i wouldn't have picked out the rest though! no wonder it looks so nice with all that work put into it. Cool! I really like the bases. I just got mine, and I'm amazed on how much detail there is. Great job bringing that out. Thank you. I have really enjoyed that there are a few different bases in there too. It really helps to give that little extra variant. Is it just my computer, or are the links broken? They're fine, though they're hosted on Photobucket which might be the problem. If anyone can suggest a better hosting site for me I'd really appreciate it. The one that I used to use went under. Imgur seems to be giving me a lot less grief than photo bucket ever did.